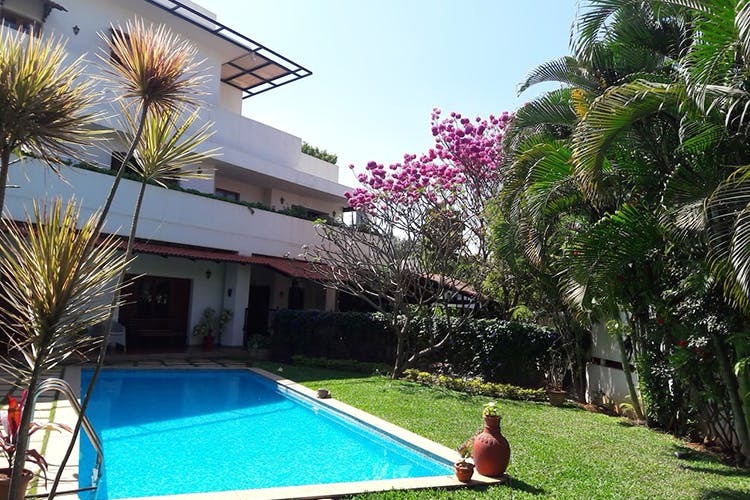 A gorgeous penthouse with a garden and swimming pool to unwind in, this Airbnb in Whitefield is perfect to get the real feel of Bangalore without shelling out big bucks. The next time you have friends or business associates in town, forget hosting them at a hotel. This Airbnb in Whitefield has all the making of a hotel but is really a penthouse with a charming garden and pool to boot. Priced at INR 3,000 a night, it’s a real steal. Apparently designed by an architect, this private home lends out two rooms for four guests, so if you’re looking for a quick escape from the city, pick this one. It’s convenient enough to be in Bangalore, but is far enough from the city centre to be away. One of the rooms is on the ground floor, the other the penthouse that is accessed via an external staircase. The penthouse one is our favourite as it has access to the terrace that overlooks Whitefield, and surprisingly has plenty of trees, with the buildings only in the distance. It also has an al fresco kitchen and dining area if you want to stay in, cook yourself a meal, and enjoy it on the terrace with a glass of wine. What we love about this home is that it’s got a wonderful landscaped garden to help you soak in the balmy Bangalore air, as you flip through a magazine, or even catch up on work emails. All that matters is a relaxed setting, no? Of course, we highly encourage lounging in the swimming pool to cool off from work, shopping, wandering or just to enjoy. In addition to being an oasis of calm and quiet, in Whitefield, it’s a fabulous option if you have work in the area. Afterall, Whitefield is really a lovely area, save for the fact that it’s far from what we traditionally know as the town centre. Breakfast and WiFi are on the house in case you’re wondering what else you get for the INR 3,000 a night.